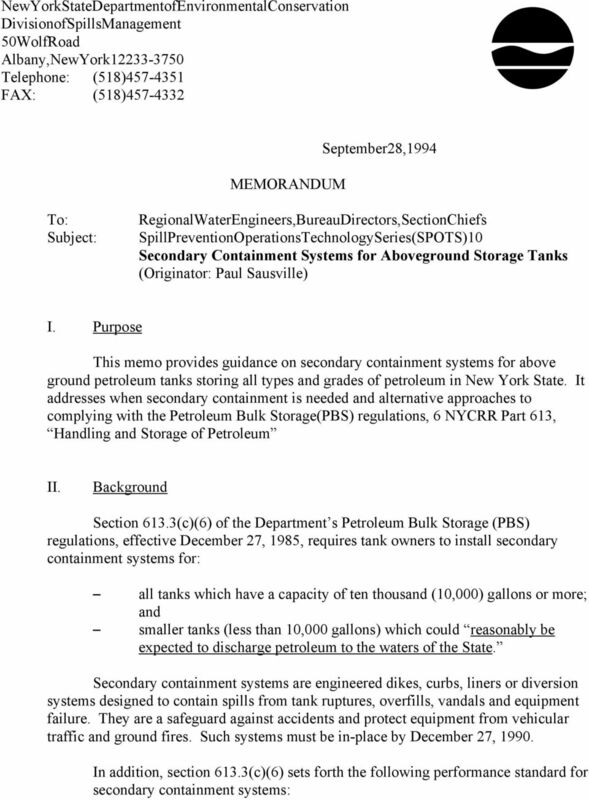 Download "Secondary Containment Systems for Aboveground Storage Tanks"
7 613.3(c)(6). 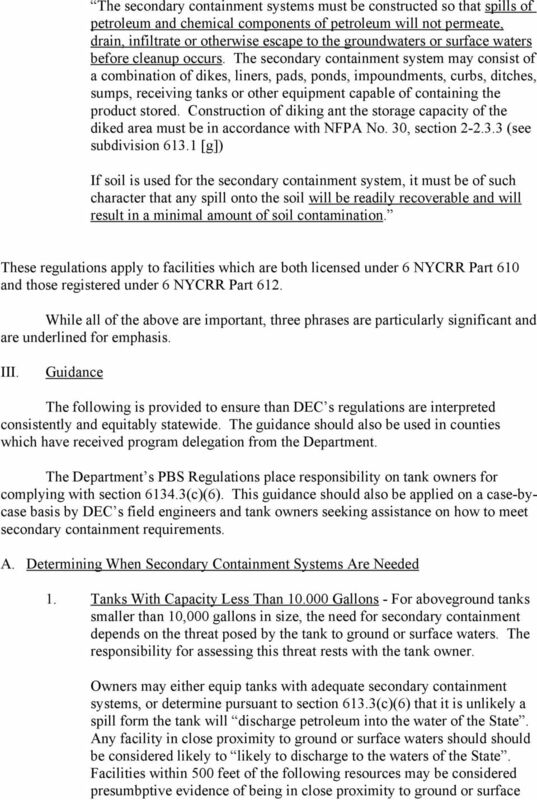 A demonstration that existing, upgraded, or new secondary containment systems meet or exceed the permeability criteria in Table 1 will be accepted as evidence of compliance with section 613.3(c)(6). 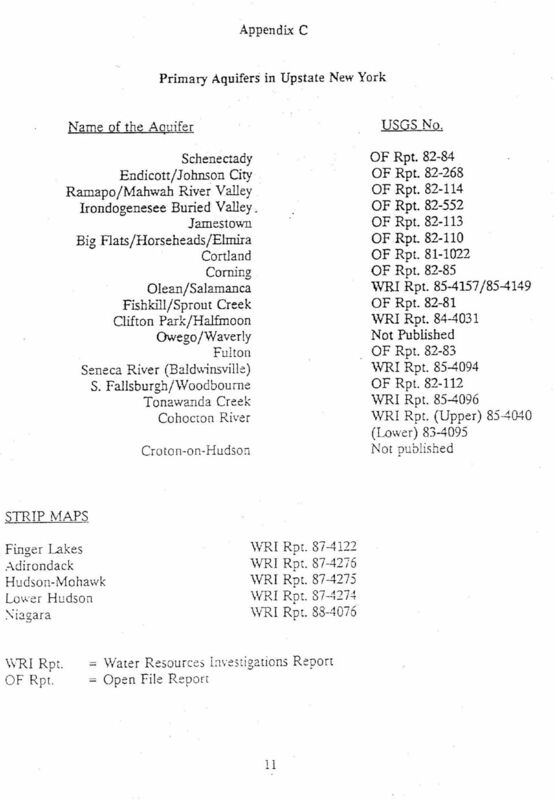 Using generally accepted engineering principles of groundwater movement in soil and the flow relationships of various petroleum products with respect to water (see report entitled Method of Evaluating the Acceptability of A Diking ystem, June 21,1988, prepared by Michael. 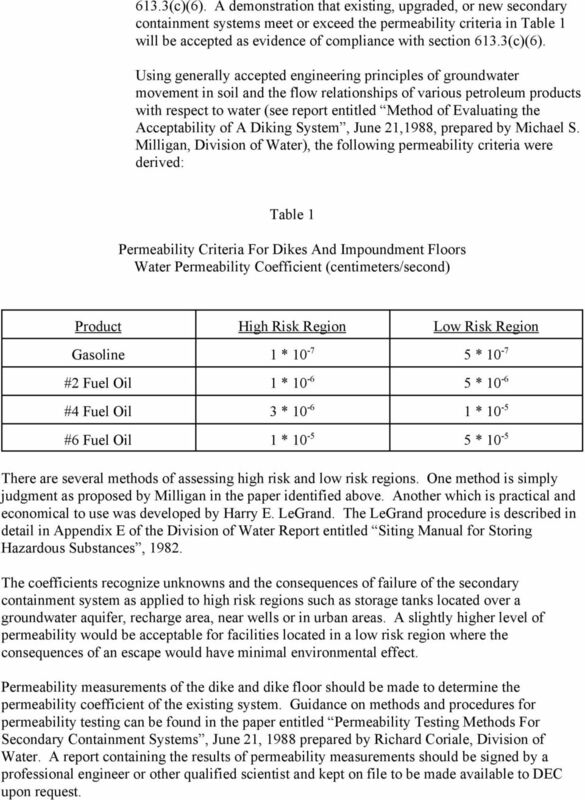 Milligan, Division of Water), the following permeability criteria were derived: Table 1 Permeability Criteria For Dikes And Impoundment Floors Water Permeability Coefficient (centimeters/second) Product High Risk Region Low Risk Region Gasoline 1 * * 10-7 #2 Fuel Oil 1 * * 10-6 #4 Fuel Oil 3 * * 10-5 #6 Fuel Oil 1 * * 10-5 There are several methods of assessing high risk and low risk regions. One method is simply judgment as proposed by Milligan in the paper identified above. Another which is practical and economical to use was developed by Harry E. LeGrand. 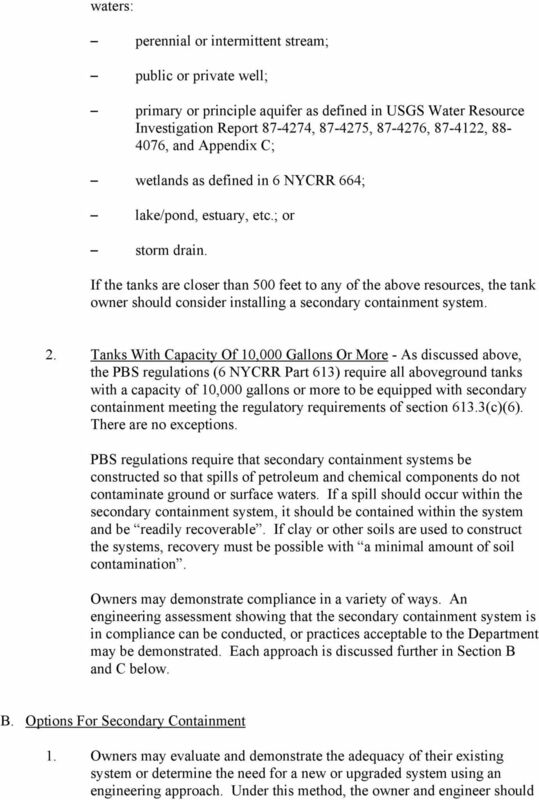 The LeGrand procedure is described in detail in Appendix E of the Division of Water Report entitled iting Manual for toring Hazardous ubstances, The coefficients recognize unknowns and the consequences of failure of the secondary containment system as applied to high risk regions such as storage tanks located over a groundwater aquifer, recharge area, near wells or in urban areas. A slightly higher level of permeability would be acceptable for facilities located in a low risk region where the consequences of an escape would have minimal environmental effect. Permeability measurements of the dike and dike floor should be made to determine the permeability coefficient of the existing system. 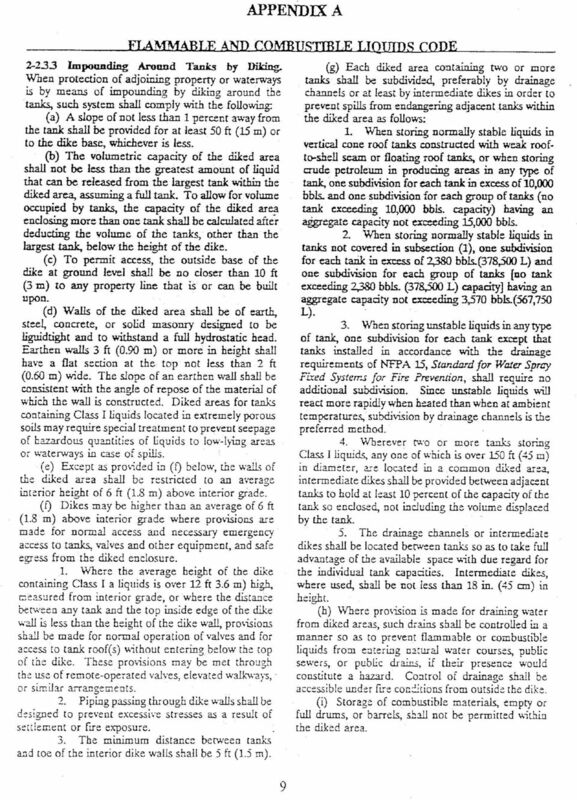 Guidance on methods and procedures for permeability testing can be found in the paper entitled Permeability Testing Methods For econdary Containment ystems, June 21, 1988 prepared by Richard Coriale, Division of Water. A report containing the results of permeability measurements should be signed by a professional engineer or other qualified scientist and kept on file to be made available to DEC upon request. 8 A. Other Criteria For econdary Containment ystems 1. Dike Construction and torage Capacity - Design standards for dikes are incorporated into the PB Regulations by referencing ection of the NFPA tandard No. 30. Flammable and Combustible Liquids Code. 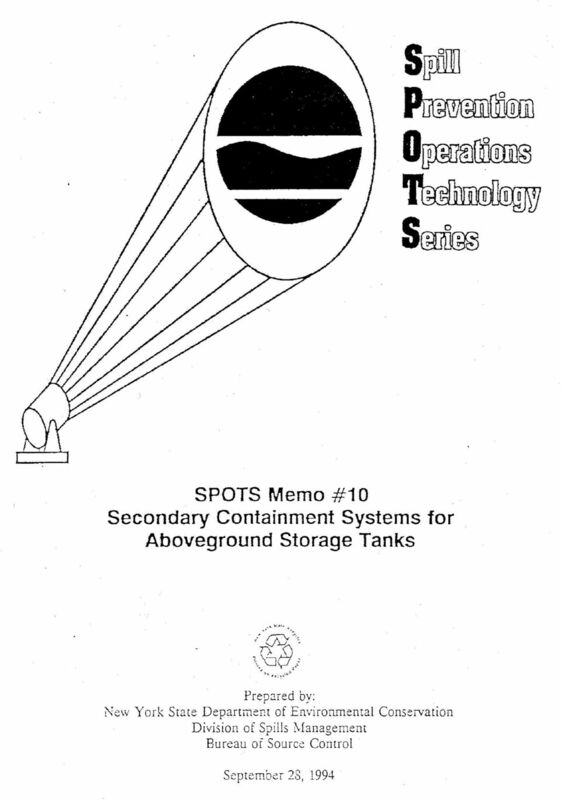 ection covers over a dozen standards for secondary containment systems of which the major ones follow: impoundment floors must be sloped 1% or more away from the tank; capacity of impoundment must be at least 100% of the volume of the largest tank within the dike; dikes must be liquid tight and able to withstand a full hydrostatic head; and storage of combustible materials and drums are prohibited within the dike. 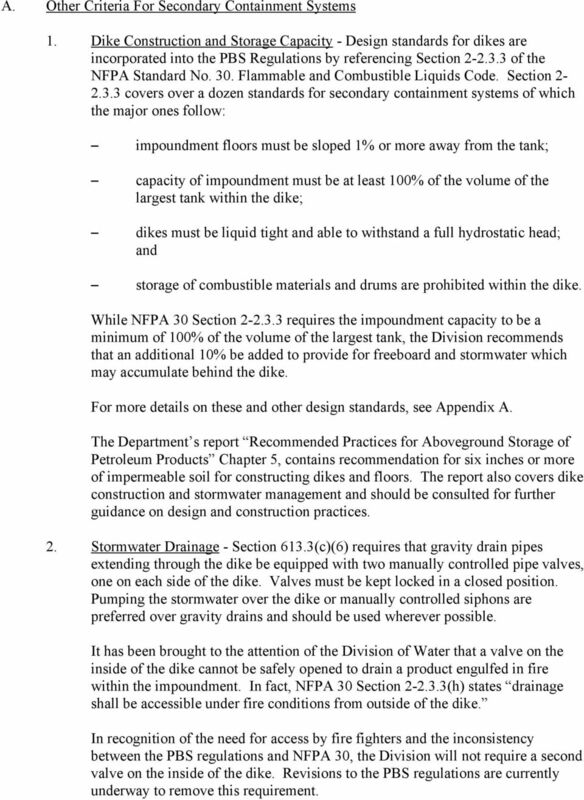 While NFPA 30 ection requires the impoundment capacity to be a minimum of 100% of the volume of the largest tank, the Division recommends that an additional 10% be added to provide for freeboard and stormwater which may accumulate behind the dike. For more details on these and other design standards, see Appendix A. 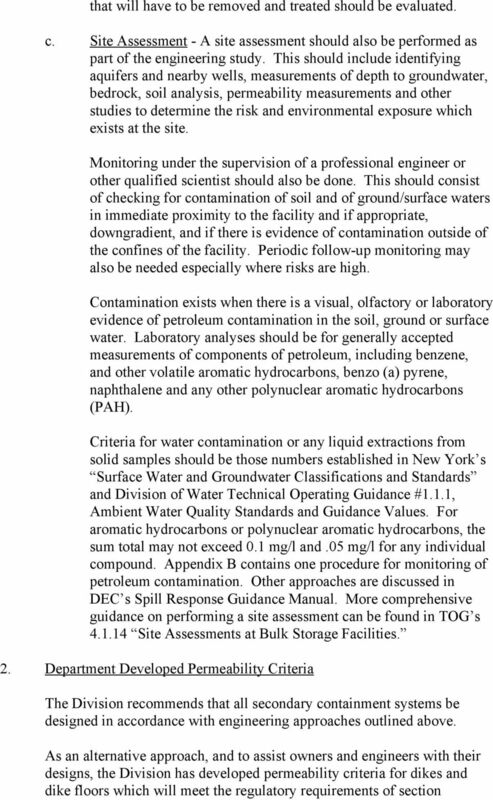 The Department s report Recommended Practices for Aboveground torage of Petroleum Products Chapter 5, contains recommendation for six inches or more of impermeable soil for constructing dikes and floors. The report also covers dike construction and stormwater management and should be consulted for further guidance on design and construction practices. 2. tormwater Drainage - ection 613.3(c)(6) requires that gravity drain pipes extending through the dike be equipped with two manually controlled pipe valves, one on each side of the dike. Valves must be kept locked in a closed position. Pumping the stormwater over the dike or manually controlled siphons are preferred over gravity drains and should be used wherever possible. It has been brought to the attention of the Division of Water that a valve on the inside of the dike cannot be safely opened to drain a product engulfed in fire within the impoundment. 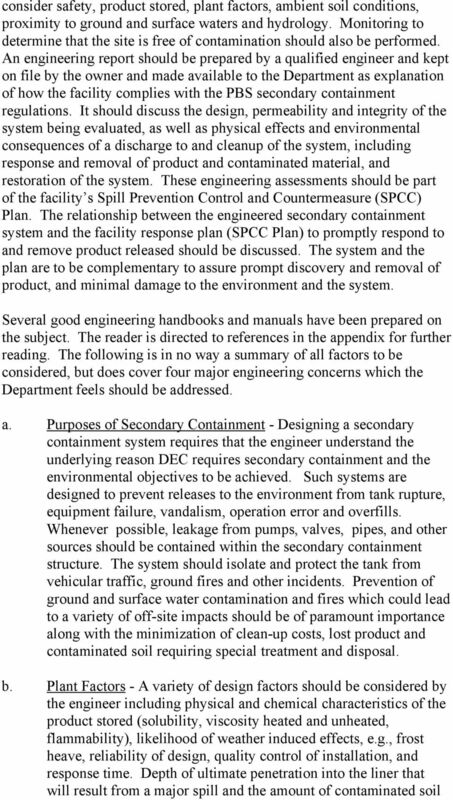 In fact, NFPA 30 ection (h) states drainage shall be accessible under fire conditions from outside of the dike. In recognition of the need for access by fire fighters and the inconsistency between the PB regulations and NFPA 30, the Division will not require a second valve on the inside of the dike. Revisions to the PB regulations are currently underway to remove this requirement. Improper storage of fuel on construction sites will increase the risk of water pollution that may occur as a result of leaks or spills. Improper storage of potential pollutants will increase the risk of water pollution that may occur because of spills. Section A SPCC Plan Implementation Checklist This section of the report addresses compliance with certain requirements of Federal Regulations 40 CFR 112. I. STATUS OF SPCC PLAN (40 CFR 112.3) YES NO A. Critical Regulations SUMMARY OF. 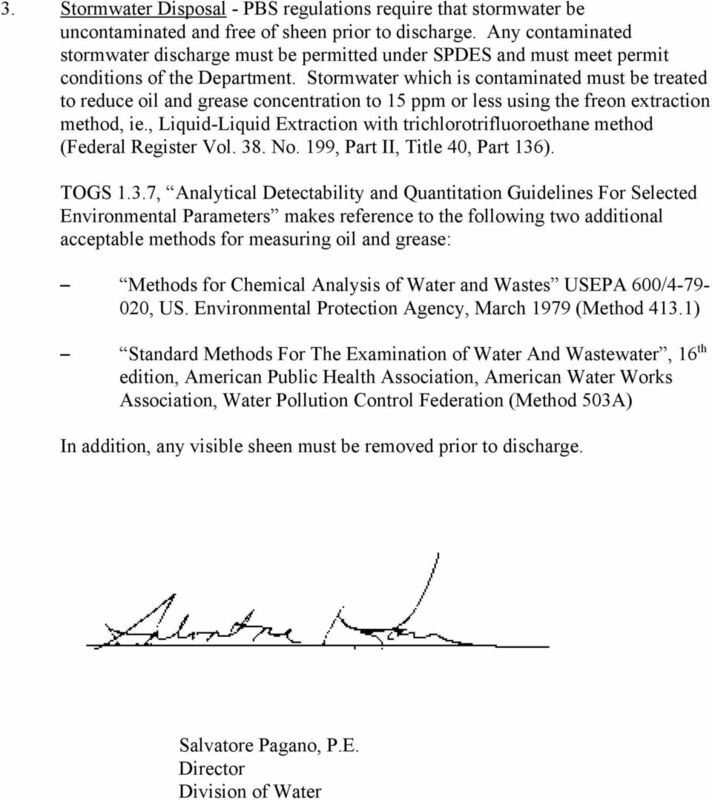 Stormwater Management Regulations (National Pollutant Discharge Elimination System or "NPDES ) 40 CFR 122. 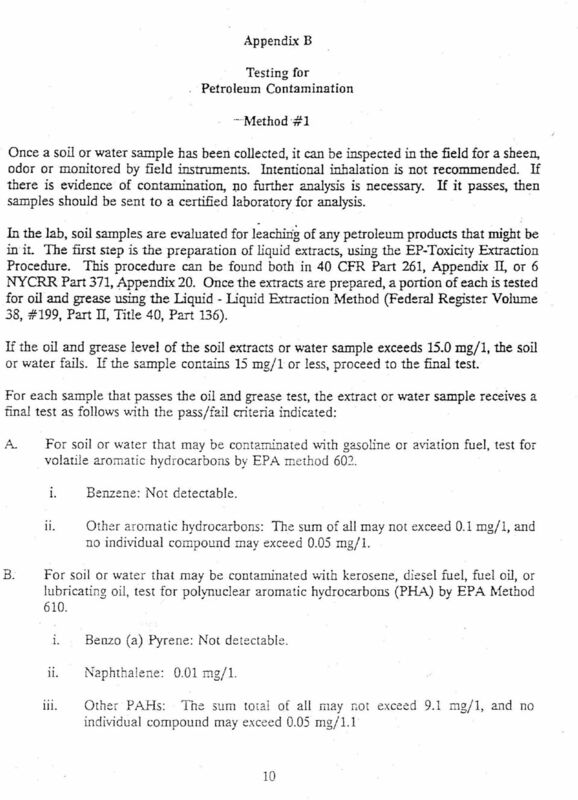 IAC 7/2/08 Agriculture and Land Stewardship Ch 44, p.1 CHAPTER 44 ON-SITE CONTAINMENT OF PESTICIDES, FERTILIZERS AND SOIL CONDITIONERS [Prior to 7/27/88, see 21 Ch 9] PESTICIDES 21 44.1(206) Definitions.